Key difference: The main difference between friend and best friend is the fact that, while we may consider a number of people as friends, we only have a handful of best friends, usually only 1 or 2. Essentially, friendship is a relationship between two people who hold mutual affection for each other. However, we always tend to label our relationships, such as friend, close friend, true friend, best friend, etc. The main difference between friend and best friend is the fact that, while we may consider a number of people as friends, we only have a handful of best friends, usually only one or two. A person associated with another as a contact on a social-networking Web site: We've never met, but we're Facebook friends. Hence, it only stands to reason, that a best friend is someone who is the best person from your friends. They are the most advantageous, desirable, or most suitable to you. You tend to prefer your best friend over your other friends. Your best friend is the one you always think of, when considering your friends; the one you is your first preference among your other friends. The ability to be oneself, express one's feelings and make mistakes without fear of judgment. A friend is someone you hang out with in a group, someone to talk to, and to laugh with. Friends stand out in a group of people. Friends are someone who you are happy to spend time with you doing absolutely nothing at all, someone who doesn't mind driving you on stupid errands; someone who tries to help you. A friend is someone who would never intentionally hurt you, lie to you, deceive you, manipulate you, abuse you and who takes great care to be kind to you. While, a best friend is someone who you want to hang out with alone, someone you can talk to about anything, someone you can ask for advice, without being judged. You can share secrets with them, talk about deep or personal things, and tell them anything. A best friend stands out in a group of friends. A best friend is someone who is more like extended family, a sibling you never had, someone who know everything about you’re your insecurities, your secrets, etc. They are brutally honest and loyal, who can be trusted always. They are the one who will try to help you, even when they have no idea how. They’ll come with you when you have to do boring things like watch bad recitals, go to stuffy parties, or wait in boring lobbies. 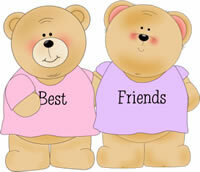 Best friends are the ones on whom one can always depend and for whom you will do anything, and they for you. They are the shoulders to cry on, because they are always there for you and they truly know you and care about you. really trueee...my best friend is the most important part of my lifeee...n makes my life soooooo beautifullll...love you my best friend...!!!!! !